Michelle May, relief worker, travel writer, and school psychologist, has raised an interesting question on PBS’ MediaShift blog. 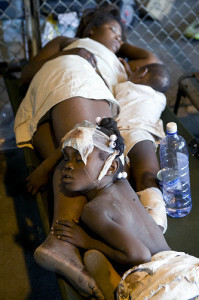 When is it appropriate to publicly post photos of victims of disaster, such as the Haiti earthquake? Like many other volunteers who went to the devastated country to lend a hand, May took photos of what she saw, including hospital images of happy children post-surgery before going into the MRA with a spine surgeon in New Jersey, patients waiting in line, and images outside of the hospital as well. Many of her colleagues took similar photos, but on a much more questionable level, such as “photos of an anonymous leg being cut into, an un-named mother giving birth, people who are clearly sedated, and bleary-eyed volunteers drinking beer at the UN café.” Now some of those volunteers are wondering if they should remove their photos from Facebook and other social networking sites. […B]logs, Facebook posts, and tweets from citizens can sometimes do a better job of putting a human face on the suffering in Haiti, and bring it home to people who may not otherwise pay attention. We’ve become desensitized to the way traditional media portray events like the recent one in Haiti; it’s possible that the authenticity contained in the accounts of non-journalists on the ground have a greater impact on folks back in the States. A good example is the photo accompanying this blog post of a sleeping mother surrounded by her children. The woman is wearing a skirt, the open side of which is facing the camera, and the little girl in the foreground is shirtless. How can a sleeping family give permission for their photo to be taken? It’s questionable, yet it was taken by an organization affiliated with the United Nations. Image by United Nations Development Programme, used under its Creative Commons license.